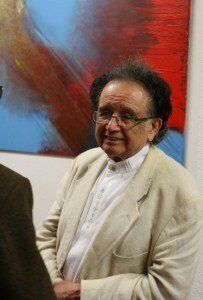 Antonio Máro was born in 1928 in Catacaos, northern Peru. He has been painting since his early childhood. His mythical sources lie in his homeland – the pre-Columbian heritage of Perú forms the spiritual origin of his work. His first teacher was the well-known artist Ricardo Grau, a native of Belgium, who spent his entire study period at the Académie des Beaux Arts Academy in Brussels, and from there he was appointed as director of the Academy of Fine Arts in Lima. In the course of his medical studies, Máro came to Germany, where he met Willi Baumeister. In Baumeister Máro found the right master as a guide for his artistic future, in which abstraction and figurative elements combine. Máro has been working with metal paints since the early sixties. In order to realize his artistic intentions, he developed a unique technique, the “Contraplano technique”, and created his distinctive manuscript, which secured him international recognition. This technique brought him to monumental sculptures: perceptual spaces that extend beyond the actual format of the image. In 1978, Máro was commissioned by the city of Meinerzhagen to create an oil painting for the town hall: the largest oil painting of the 20th century. Máro became one of the great hikers between two cultures, the culture of Latin America and Europe. His work is a decisive contribution to the Western culture of our day. Antonio Máro – art knows no boundaries – also deals with original color etchings, lithographs and sculptures in various materials such as wood, stainless steel, bronze and ceramics. Fried Rubin, in May 2004: On the Contemporary in the work of Antonio Máros. Participation in the Venice, Sao Paulo and Havana biennials as well as numerous awards and prizes.